CARIBOU - Companies in Aroostook County looking to expand their business with federal, state and local contracts are urged to attend a free informational session in Caribou Wednesday, March 25. Maine Procurement Technical Assistance Center (PTAC) counselor Dana Delano of Northern Maine Development Commission and Melody Weeks, PTAC program manager, will explain how to read the details of local, state and federal government product and service solicitations and how to respond with a winning bid proposal. "Government bid solicitations can be a bit intimidating to business owners looking to expand their market. This workshop will breakdown the details of a solicitation and how to respond with a positive proposal," said Delano. Maine PTAC provides a variety of government contracting technical assistance services to Maine-based businesses of all sizes. "From cleaning services, to all types of construction, and even snow plowing, local, state and federal governments are a big consumer of products and services," added Delano. "We want to assist local companies in obtaining these opportunities in order to grow their business." 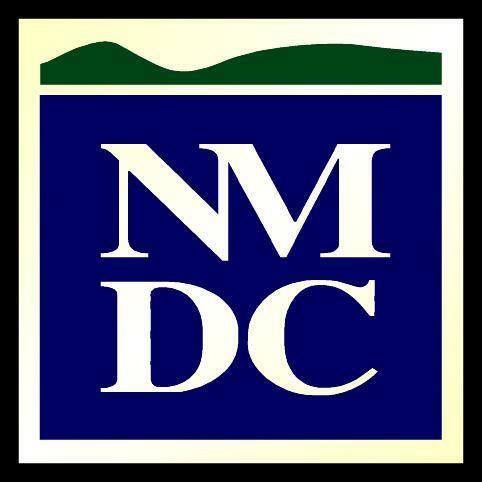 The seminar, sponsored by NMDC, will be from 8:30 a.m. - 10 a.m., Wednesday, March 25, at Northern Maine Development Commission, 11 West Presque Isle Road, Caribou. To register, contact Dana Delano at ddelano@nmdc.org or call 521-5840. PRESQUE ISLE - The Aroostook Partnership for Progress (APP) board of directors spent a good portion of its most recent meeting taking a look at the big picture of the organization and how to better chart a course for the future. APP CEO and President Bob Dorsey said he wanted to have the discussion to gain inputs on how the members viewed the more than 10-year-old economic development organization. "The unanimous consensus is, there is value in APP," said Larry Shaw, President of MMG Insurance, an original investor in the Partnership. "Our thought process should be about the diversity of membership." 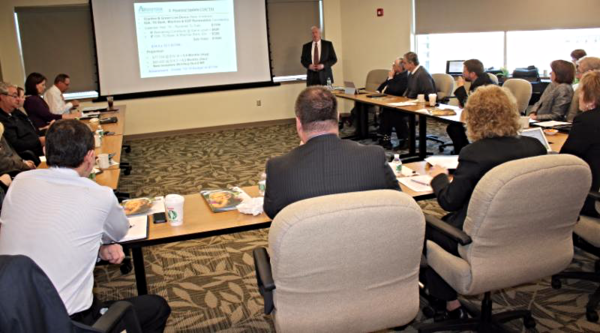 APP President Bob Dorsey addresses investors at the Friday, March 13 board of directors meeting held at TAMC. Currently APP has more than 25 investors, which contribute anywhere from $2,500 to $25,000 annually. "Joining the Partnership is an investment versus a donation," said Shaw. "The purpose is to ensure the sustainability of The County. You are investing in Aroostook County when you write a check here." However, more than one board member stressed APP is not just about finances. "This is not just about writing checks, we need input of all the investors," stressed Cheri Doak of Key Bank. Bob Clark, Executive Director of Northern Maine Development Commission (NMDC), which represents the public sector in the Partnership, said the organization needs time, talent and treasury to grow the economy of Aroostook County. Chris Anderson, President of F.A. Peabody Company, another long-time investor, suggested the Partnership also work to educate businesses and the public on how the organization is making a difference in areas such as growing the workforce and enhancing the forest and agricultural economies. Anderson also suggested adding a tagline to the APP logo, "Driving Aroostook's Economy, Together." "I was very pleased with the engagement, ideas and intensity of the dialogue," said Dorsey. "It was encouraging to see how much the Partnership means to these County business leaders and how much desire they have to keep APP growing." Dorsey added four common themes emerged from the discussion. Greater interest in economic development collaboration - a more inclusive effort - Economic Development Cluster. Growing APP membership effort and greater interest on part of smaller businesses to join APP effort. Board design that includes private sector diversification (large, medium and small). Idea of an economic development summit. "I envision the Executive Committee of APP will get together again to discuss next steps," said Dorsey. "Perhaps the discussion could be centered on four areas: message, structure, events and actions." Nearly 20 businesses and organizations were represented at the meeting, held March 13 at TAMC in Presque Isle. The Aroostook Partnership for Progress is a public-private partnership dedicated to aggressive and effective results-oriented economic development actions that leverage the financial commitments and talents of the private sector in close partnership with the public sector. More information about APP and a listing of investors can be found at www.appme.org.